Explore randomly‐generated worlds and build amazing things from the simplest of homes to the grandest of castles. Play in Creative Mode with unlimited resources or mine deep into the world in survival mode, crafting weapons and armor to fend off the dangerous mobs. Create and explore your very own world where the only limit is what you can imagine. Includes five skin packs and two texture packs to customize your gameplay! Use the touch screen to check your map or manage your inventory! 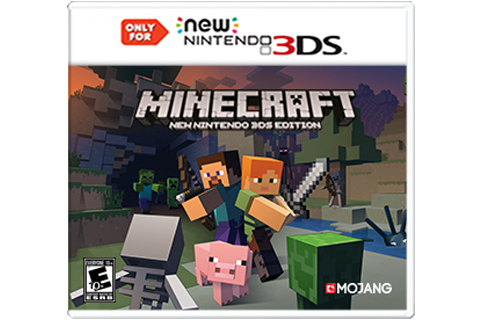 Please note: Minecraft: New Nintendo 3DS Edition is compatible with the New Nintendo 3DS XL, New Nintendo 3DS and New Nintendo 2DS XL systems. It is not compatible with other systems, including Nintendo 3DS, Nintendo 3DS XL, and Nintendo 2DS.